Debussy’s music makes for a special choral experience. It’s fascinating to hear his augmented harmonies and modulating seventh and ninth chords intoned by mixed voices, humanizing what sometimes sounds too beautiful to be of this world. Alas, his Trios Chansons last but a brief six minutes, but this generous disc contains many other choice items from the French choral repertoire. The vocal mastery of Saint-Saëns’ Serenade d’hiver and Hymne au printemps should come as no surprise to anyone familiar with his operas, and the same can be said for Massenet’s Chansons de bois d’Amaranthe. Of special delight is the choral arrangement of Canteloube’s Bailero, with alternating male and female solos. Fauré’s Pavane also is fully fleshed-out, with the added help of the piano. The piano features as well in the Delibes selections, particularly the gently dancing Les Nymphes des bois. Returning to the impressionist style, Ravel’s Trios Chansons create the same magical effects as the identically named Debussy pieces. 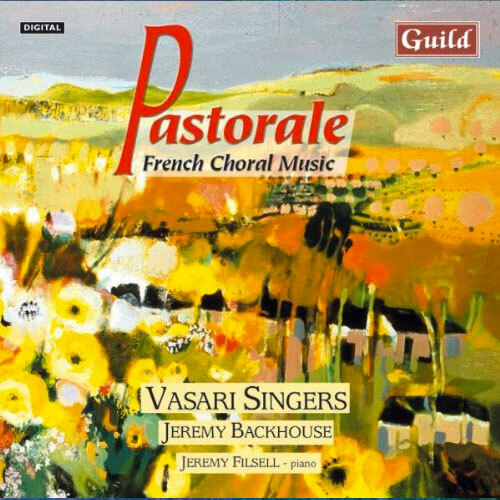 Under Jeremy Backhouse the Vasari Singers perform with confidence, skill, and musical élan, creating, with the aid of Guild’s natural sounding recording, a wonderfully relaxing and atmospheric interlude. In the 20 years since its formation, the Vasari Singers have shown themselves to be a versatile ensemble of enormous calibre. This recital of 19th- and early 20th-century French music not only extends their recorded repertoire, but adds further to their well deserved reputation. The singing is finely controlled throughout, with attention paid to melodic beauty, intonation and ensemble in a carefully crafted programme of contrasting pieces which show the choir at its best. Pastorale: French Choral Works – Essex Chronicle - Once again, another source of fresh ideas for choral conductors. Jeremy Filsell pops up again as accompanist of the Vasari Singers who perform a programme of French music called Pastorale (Guild GMCD 7199). Some of the programme is performed fairly often by chamber choirs like Debussy’s Trois de Charles d’Orleans, but there are some other treasures here to enjoy by Delibes, Ravel and Massenet. Once again, another source of fresh ideas for choral conductors. Pastorale: French Choral Works – American Record Guide - "...they are polished professionals who sing with commendable spirit." This is worthy of the choral aficionado’s attention for the generously apportioned repertoire – as delightful as it is seldom performed. Delibes’s “Nymphs des bois”, Massenet’s “Oiseau des bois” from his Amaranthe songs, Ravel’s chansons, and the Saint-Saëns “Serenade” are just some of the charmers that await you. While I can’t say I love everything the Vasaris do, they are polished professionals who sing with commendable spirit. The fellows can be especially good, as you’ll hear in the Saint-Saëns “Sereande to Winter”. Ravel’s “Ronde” quivers with energy, while Massenet’s “Oiseau des bois” is sweet and flirtatious to a fault. I’m less impressed with the cool, clear soprano soloist who adds no sparkle at all to Debussy’s “Tambourin” or Ravel’s “Birds of Paradise”. A slow, stodgy Fauré “Pavane” and some forced crescendos in the Saint-Saëns “Hymns to Spring” also detract. But the good outweighs the not so good by a comfortable margin, and the repertoire is a joy. Pastorale: French Choral Works – International Record Review - Throughout this deeply impressive recital it is well-nigh impossible to choose one track above any other. This is distinguished singing from a superb choir, and – for once – a programme of music by seven composers does not appear as a hodgepodge of little appeal. There is some astonishingly original choral writing here, particularly to be found in those pieces which are almost never heard, and the reasons for their neglect can have little to do with the quality of the music. Delibes’s Les Norwègiennes, with a remarkable ‘slipping on the ice’ onomatopoeia, is a case in point, and the first of Saint-Saëns’s Deux Chansons, Op.68 – ‘Calme des nuits’ – is a wondrous piece. It is fascinating to hear Canteloube’s a cappella settings of two of the more famous of his songs of the Auvergne, notably the haunting ‘Baïléro’ alongside the equally well-known Fauré Madrigal and Pavane, with piano accompaniment, the choral writing in the latter work coming across with exemplary clarity. So good are these that one might put in a plea for a whole disc of Fauré’s church music by the Vasari Singers. Throughout this deeply impressive recital it is well-nigh impossible to choose one track above any other, so consistently attractive and moving are the music and the manner of the performances. The Ravel chansons, to his own texts, are brilliantly done here; Massenet’s Amaranthe songs are a real treasure, and Jeremy Filsell’s piano accompaniments are excellent. The recordings have been carefully balanced with the occasional piano accompaniment in order to maintain the clarity of the choral writing, and the acoustic of the Great Hall of Dulwich College is well suited to this repertoire. Although there is a suspicion of high notes occasionally ‘catching’ the microphone, nothing should prevent an enthusiastic recommendation for a conspicuously successful album, which is completed by good notes from David Bray. The booklet also has full texts and translations.